There is only one location where you can get a wild lemur picture: Madagascar. It is the only place in the world where they still occur naturally. In zoos, the ringtailed lemur is the most commonly stocked. The only reason lemurs still exist today is because of the fact that Madagascar is isolated and void of monkeys and other predators/competitors for the same habitat and food. There are almost 60 species and subspecies – some nocturnal and some diurnal. The nocturnal lemurs are usually smaller in build and live generally more secluded lives. 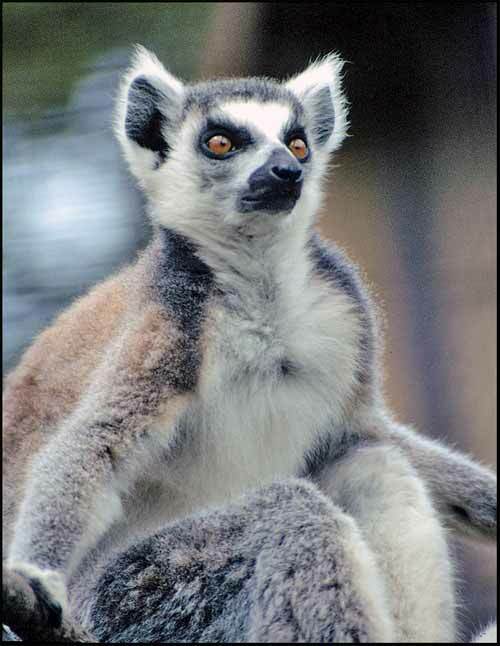 The diurnal lemurs have similar characteristics to monkeys and have a stronger social bond. The habitat preference of the different species varies, but generally they occur in forest areas and eat mostly fruit and other plant matter like leaves and bark. Some also eat insects and honey, others mainly bamboo. The Indri lemur is the largest at 7-10kg (15½ - 22 pounds). If you are lucky enough to spot one of these, keep the video camera close by as they might treat you to their strange and spooky whale-like call. The Pygmy Mouse lemur is the smallest primate in the world, at about 6cm (2.4") in length and a mere 30g (just over 1 ounce) in weight! 8 species of lemur are listed as vulnerable, 5 as endangered, 2 as extremely endangered, and many more are at risk - mainly due to natural habitat reduction on the island. For example the Lake Alaotra bamboo lemur (or bandro) only live in the papyrus reed beds around Lake Alaotra. Its continued existence is therefore dependent on protection of those specific papyrus reed beds. The Aye-aye is on the endangered list, and probably the oddest of the lot, with its long middle finger which it uses as an insect finder. After tapping the tree bark, it uses its sensitive hearing to detect the movement of insect larvae. Studies have found that the aye-aye is capable of sensing insect movement at an amazing depth of 3.6m (12 feet). Madagascar, Madagascar and… Madagascar. They occur in almost all the ecosystems within the island, north to south across 24 of its parks. The two parks with the biggest variety and therefore best chance for you to get a few lemur pictures, are Andringitra and Zahamena. For more information, lemur picture and a full list of the different species existing today, visit the Wild Madagascar website.